We recently completed a modern polished concrete overlay project for cutting edge university accommodation. Honestone worked together with Hutchinson Builders to provide polished concrete flooring to build a unique and contemporary accommodation for the students living on campus in Wollongong University. The student accommodations on campus support the learning process and affect the success of the students. The construction of such an integral part of campus life requires a team of top-notch architects, builders, and flooring specialists. Our team impressed Hutchinson Builders with our expertise in polished concrete overlay in Wollongong, as well as our work ethic. 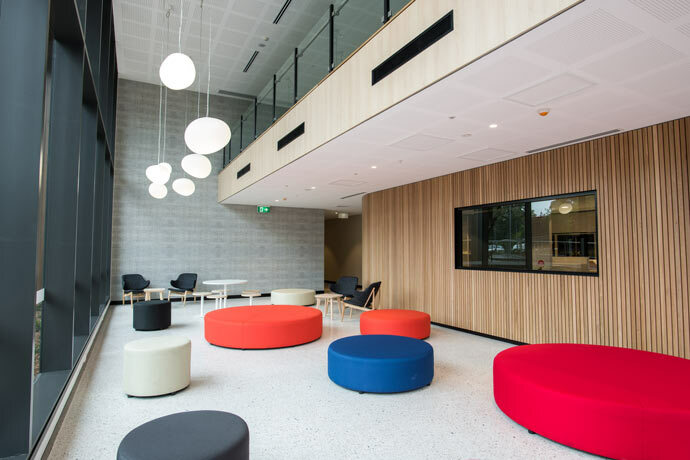 Living & Learning custodians selected Hutchinson Builders to join the consortium that successfully secured the PPP (Public-Private Partnership) with the University of Wollongong to develop their student residences. The Hutchies (as they like to call themselves) have been building the structures in which Australians live, work, study, shop and relax since 1912. Despite being one of Australia’s largest construction companies, Hutchinson Builders remains a business based on people and relationships. Hutchinson projects posess a level of sophistication that can only come from consistent and high-quality performance. They have about 250 projects around Australia every year, ranging in size from relatively small residential and commercial maintenance works to significant multi-million-dollar projects. This project was no exception. Hutchinson Builders wanted flooring specialists who could take on such a project and match them in their ability and quality of work. So Hutchinson Builders began the search for the right specialists in polished concrete overlay in Wollongong. 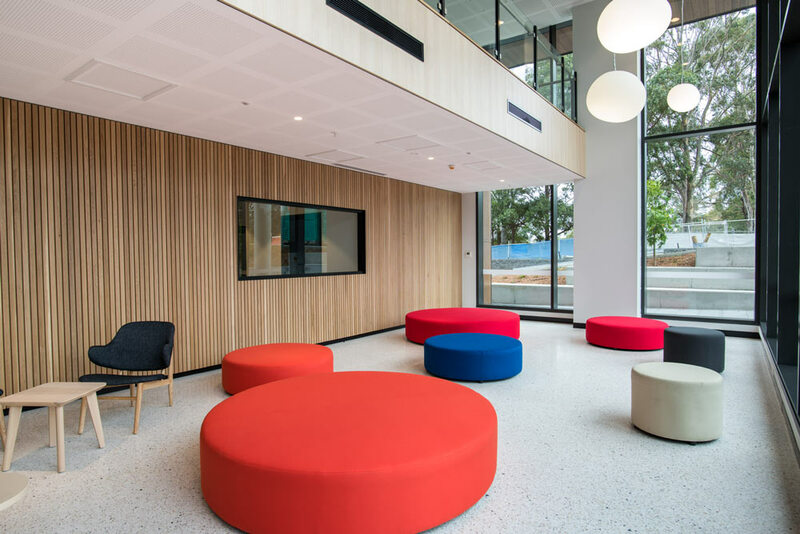 Chadi Akouri, Design Manager for Hutchinson Builders approached us for a solution that would satisfy the visual look of polished concrete originally specified for the new cutting-edge design of the Kooloobong student accommodation at Wollongong University by architects GroupGSA. The main reception lobby is the first point of entry to the new multi-million-dollar facility. We knew right away the importance of first impressions to such a space. What they needed was a very specific requirement for flooring. The topping had to be of minimal thickness, much less than traditional concrete, to meet adjacent floor finishes. An additional requirement was to create a custom colour not often available with traditional concrete. From a round of sampling, we were able to create a custom blend of off-white cement with white marble and river gravel aggregate. Approval came fast for our custom mix. With installation timing critical, our team had to work quickly to finish the floors. In particular, speed and timing was crucial prior to the extensive feature wall panelling being used throughout the space. As the Honestone polishable overlay is only 12mm, we used a rapid cure engineered screed to firstly build up the slight substrate set down to allow the finished floor to meet adjacent floor finishes. With the final bulk out area complete and angle trims in place for recess carpet areas, the decorative topping was now ready to install in only 24 hours after the bulk out. Our team was able to install the entire ground floor lobby topping in one day. We immediately proceeded with grinding, polishing and final sealing. We handed over the floor after only one week (excluding the bulk out). It had an onsite slip test certification of P3. Dean Mustard, Foreman from Hutchinson Builders, had all praises for the team at Honestone. “We found out about Honestone as a result of receiving positive recommendations from local suppliers praising the level of professionalism and quality that we could expect. From early discussions, into engagement and through to completion, the team at Honestone lead by Rick Hendriks did not disappoint. The level of professionalism, site conduct and quality was exceptional. Early talks with Honestone lead to the selection of the most appropriate system for the project. The challenges of introducing a floor finish into an unnecessarily deep setdown was overcome with the application of a suitable bulk filler. Additional challenges such as the coordination of inset floor mats, adjacent vinyl finishes that required a zero threshold and the introduction of stainless steel construction joints were easily managed. This is thanks to Honestone’s professional approach to providing sound advice. Honestone were proactive in understanding the programming challenges with the project. They actively conveyed their availability leading up to the installation works. Although these works were split into multiple phases, Honestone set and achieved the completion dates to the satisfaction of Hutchinson Builders. Honestone specialises in polished concrete, concrete floor preparation, industrial flooring and seamless decorative flooring for various industries. We have outstripped boundaries when it comes to superior flooring and walling enhancements. But our team is more than that. We pride ourselves on our reliability, punctuality, excellence in managing costs, professional communication and addressing potential issues without a fuss. Our relationships with our clients are built on trust and competence. If you need experts in polished concrete overlay in Wollongong and other areas in New South Wales whom you can rely on, feel free to reach out to us. Rapid: installation generally only takes 5-7 days from start to final sealing. Thin set: at only 10-12mm, polished concrete or terrazzo can now cover any sound concrete floor. Seamless: means no grout joints allowing free-form design and ease of cleaning. Combination. To get an idea of the colour range available, visit our polished concrete colour selector page.